Ontario's IESO has put out some figures for 2014, and now I'll provide an actually independent look at Ontario's electricity system operation. 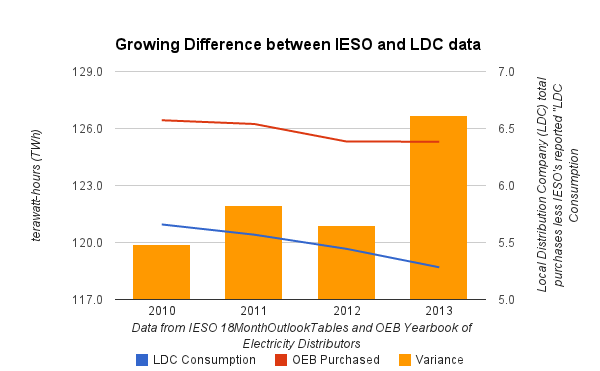 Most of the IESO's 2014 Electricity Production, Consumption and Price Data has data that makes sense to the IESO - to the uninitiated the numbers are very misleading. While the IESO has published measurements as per the IESO's insular worldview, it hasn't always showed the discipline to use its own jargon to communicate the numbers honestly. Total energy consumption of 139.8 TWh in 2014 was slightly lower than 2013 demand levels. Well, no. "consumption" certainly was not 139.8 TWh no matter how loosely one uses the term "energy." An exploration of the figures from the IESO is necessary as most people will leave the IESO's reporting page less knowledgeable of Ontario's electricity sector than when they arrived - and it would be nice if that weren't so. I'll try not to bore you while actually writing on things I am distinctly qualified to write about: data collection, discipline, and imperfection - which sounds pretty dry, but it it involves courage, integrity, politics, philosophy and that vision thing. I'll start with a vision thing. Reports of any kind are designed for an audience - in the vernacular of the IESO, the reporting is for "stakeholders", which I could refer to as relevants, and the nature of the reporting will tell us who they consider to be relevants. As the IESO has just gobbled up the Ontario Power Authority, this is the first reporting that displays whether they perceive relevants in 2015 to be different than those in 2014. The summer peak was 21,363 MW, roughly 20 per cent lower than the all-time high set in 2006, partly due to conservation and energy-efficiency measures and to embedded solar generation capacity that reached 1,500 MW. 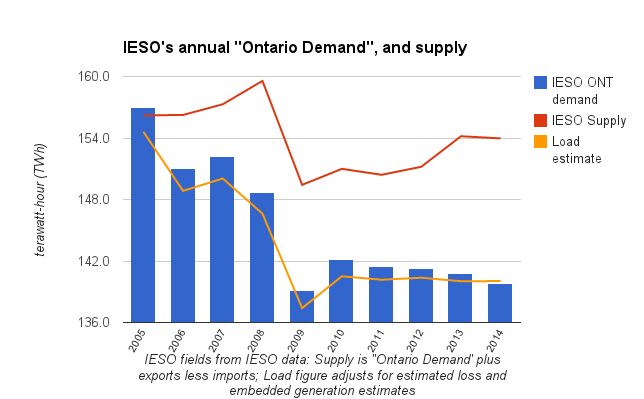 Most sane people would think of "load within Ontario" as demand, regardless of whether the IESO-Administered market met the demand, or generators within the distribution company's grid did. 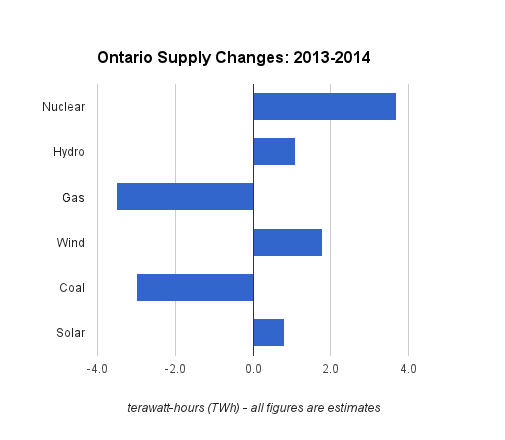 In the past the IESO might have been excused for not even attempting to report Ontario's electricity consumption, but understand that the growth in embedded generation is due to contracting of new, primarily wind and solar, capacity by the Ontario Power Authority (OPA) that is now "merged" with the IESO. The IESO therefore now administers the contracts, which includes paying out on the contracts, based on generation, and recovers the costs by billing consumers a global adjustment charge based on total consumption - they just don't report what the amount of generation they pay out on is, or the consumption the use to calculate the charge per watt-hour. The Ontario Energy Board provides some summary reporting that shows the shortcomings of IESO reporting in past years. Let's look briefly at the 2013 generation figures as they are relevant to the IESO's 2014 reporting. The IESO shows us "n/a" as the generated terawatt-hours (TWh) from solar in 2013, but the Ontario Energy Board reported in April that solar provided 0.8% of the electricity mix in 2013 - which would be ~1.2TWh. Because the IESO reports "Ontario Demand" as the sum of generation on their grid, this would lower that by 1.2 TWh, demonstating why they shouldn't communicate that as "consumption." At the roughly $500/MWh indicated in the OEB's regulated price plan documentation [Table 2, page 20], the difference for 2013 is about $600 million - which did grow the global adjustment charges, but few would know that because of the lack of transparency on those charges. It's an interesting outcome of only using data felt to have the highest integrity (accurate and from a reliable source) that a report with no integrity is produced. Some of the increasingly poor reporting quality might be better understood by cynically acknowledging the reporting is intended to please the audience the report targets. No harm in that except when the reporter does so deceiving the broader participants in the sector. The IESO takes money from every ratepayer in Ontario to collect and store meter data. It should not be a stretch to expect the entity that takes money to manage consumption data to report a "consumption" figure from that data. This initial report tells us the reporting remains for the incumbent relevants/stakeholders. If you do not have a generator on the IESO-grid or otherwise participate in the IESO market, that's not you. The IESO's report provides rate figures calculated with the same issues as their demand tallies, with added inaccuracy from yet another irrational second estimate of the global adjustment in December. The average weighted cost of the electricity commodity in 2014 was 8.95 cents/kWh*, an increase of 4.5 per cent year over year. This commodity cost includes both the wholesale price and the Global Adjustment. The final total when the IESO produces its monthly report for December will be closer to $9.07 cents/kWh. This calculation is a little meaningless since the introduction of the "Class A" global adjustment. For 2014 class B customers will average annual increases of ~6%, regulated price plan customers a little more than that (7%), and class A customers a little higher again. A quick note on the Hourly Ontario Energy Price: the IESO notes it "was 3.60 cents/kWh, almost a cent higher than the previous year," which is true, but due to a very cold winter which saw natural gas prices soar across the region, and the market electricity price along with it. Over the final 8 months, the HOEP averaged under 2 cents/kWh, down over 25% from the same period a year early. The IESO report places difference emphasis on different forms of generation: the word "wind" appears 8 times, nuclear 4, solar and gas 3. One reference to wind justifies my estimates of curtailed wind supply; "In 2014, wind reductions represented 4.6 per cent of total available wind production." That means their reported 6.8 TWh of wind generation would have been 7.1 TWh, and calculating embedded generation from the 400MW they claim pushes the total up above 8 TWh - which is what I'd estimated. That is, of course, a big record for inexplicably rapidly growing wind, but wind didn't have the greatest output increase; that came from nuclear. The IESO reports 94.9 TWh from nuclear, which is, as far as I can tell, a record despite the last reactor entering service in 1993. My estimates were a little lower at 94.4 TWh, but I also suspect about 1.8TWh of curtailment, making the operating achievement a little greater. The IESO credits the ability to curtail rapidly expanding wind with helping, "to avoid 18 nuclear shutdowns. In all, there was only one nuclear shutdown due to surplus baseload conditions during the year, down from six the year before." That's definitely a positive, but going one step further and reporting on the curtailments would be a welcome step - and one that I'd think would show total curtailment was higher in 2014. My estimate is 1.8TWh of nuclear curtailment in 2014, pushing the total curtailment over 2 TWh before accounting for hydro - which I can't do, but OPG's 2013 annual report did note 1.7 TWh of hydro curtailed, so it exists. Curtailment must rise with the demand levels the IESO is reporting down 17 TWh in the past decade while the supply indicated by IESO data is reduced only by 2. The supply isn't really reduced at all. I demonstrated solar was likely ~1.2TWh in 2013 from OEB data (0.8% of over 150TWh of generation) and OPA reporting shows growth, in in-service capacity, up over 50% in 2014. I'm comfortable with the 2.1 TWh total from my hourly estimates. Add this to the growing generation from embedded wind turbines and supply isn't down. 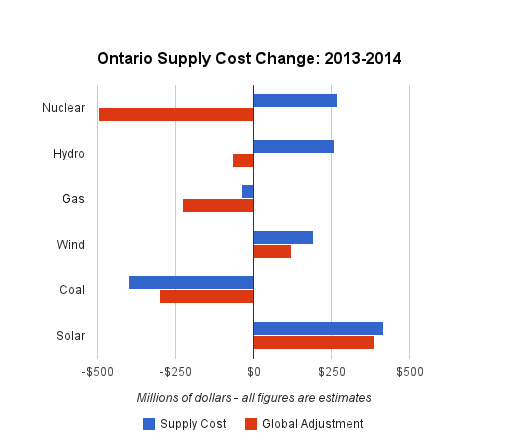 Despite growth well below the level of nuclear, and wind, solar was the main contributor to increased costs in 2014. 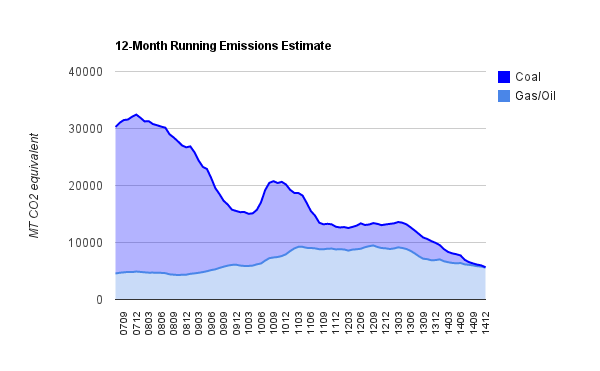 The IESO doesn't mention them, but with coal eliminated and gas generation down more than coal, and with wind, solar, nuclear and hydro all up, it was obviously a very good year for greenhouse gas emissions. My estimates may be 10-15% light once final figures are reported in 2016, but it's a terrific performance - one that may not be replicated again for decades under the Long Term Energy Plan. 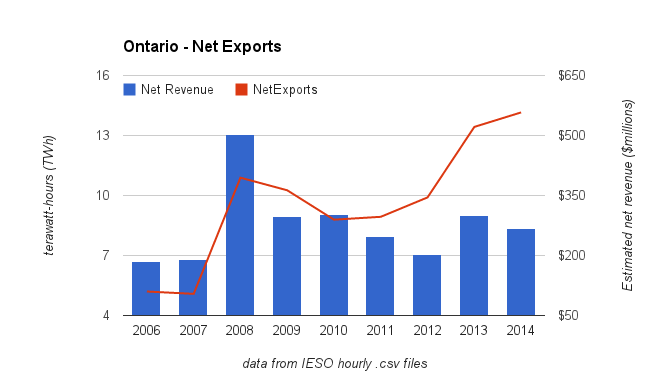 Ontario set a record for net exports in 2014 (exports less imports). One way to view exports is as net exports. Quebec exports to U.S. locations through Ontario at times, and from that perspective, it makes sense to view imports and exports together. Weighted average HOEP pricing was $27/MWh on 19.1 TWh of exports and $51/MWh on 4.9 TWh of imports. The average rate on net exports would therefore be $19/MWh, which is the lowest annual average value (by HOEP) coming on the highest net export volume. In some ways it is problematic viewing exports and imports together. The imports can distort the picture as they usually occur at higher demand periods (in Ontario and adjacent markets). Looking only at exports we see the average weighted HOEP of exports has come up a little since the IESO banned negative-priced exports in 2012, but it remains below $30/MWh when Ontarians now routinely pay above $90 and the most impactful new supply, in terms of total cost, is closer to $500. 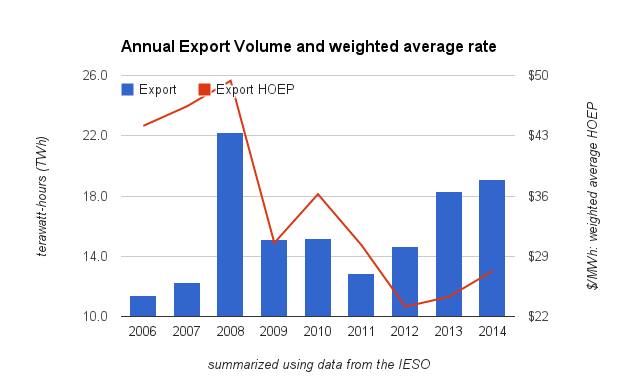 The HOEP valuation of the IESO's "Total Market Demand"in 2014 (158.3 TWh) was ~$5.5 billion, and the global adjustment added another $7 billion. Subtract half a billion for conservation and other voodoo and the average price of procuring power can be estimated at $76/MWh. The loss on selling 19.1 million $76 megawatt-hours (MWh) at $27/MWh is $933 million. That's as conservative a method of calculating the loss on exports as I know. ... 1,925 MW of wind and solar generation was operating within distribution systems. The trend of phasing out coal probably emerged, to most, before it was phased out. Wind did set an hourly record in 2014, a year in which it connected about 900 MW of capacity to the IESO's grid. Nuclear set hourly records (December 22) and annual records too - without adding capacity. I can only say that hydro had it's best hour since my data starts (in Sept. 2010) on November 16th; and I assume solar set lots of records, because the IESO has revealed a trend of that generation growing within distribution systems. Maybe 2015 will see a trend in reporting on that embedded generation - perhaps even charging for it in the month the expense is incurred instead of pushing all the solar costs from the high-demand summer onto global adjustment charges in the low demand fall. I don't expect it as I'm not seeing a trend in improving reporting or increasing transparency. The spreadsheet is comprised of data extracted from a database I keep, and that data drives some monthly reports that include, always, 12-month running totals. These also involve Google tech which is currently changing, and they may behave strangely, particularly if not viewed with Chrome or Firefox. The monthly report is updated for December; the preliminary monthly report is produced based on the 2nd estimates of the global adjustment (with complete demand and hourly generation data) and currently includes a couple of extra embedded graphics.